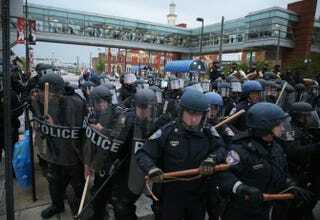 Police in riot gear block a street during a march in honor of Freddie Gray on April 25, 2015, in Baltimore. The Baltimore Police Department has finished its investigation into the death of Freddie Gray, the young, unarmed black man who was injured in its custody and later succumbed to his injuries. The department handed its findings over to the state’s attorney on Thursday, the New York Times reports. According to the Times, the van that was transporting the mortally wounded 25-year-old made a previously unmentioned stop while in transit to the police station, the department revealed on Thursday. That stop, Deputy Police Commissioner Kevin Davis said, ended up on video from “a privately owned camera” and was “previously unknown to us,” the Times notes. The implication is that officers involved in Gray’s arrest had not mentioned it to investigators. “The family and the community and the public deserve transparency and truth,” Police Commissioner Anthony Batts said during a press conference Tuesday while revealing the new information. As the Times notes, the BPD gave its findings to the state attorney’s office, which will use those findings for its own investigation. “This does not mean that the investigation is over. If new evidence is found, we will follow it. If new direction is given by the state’s attorney, we will obey it,” Batts added.